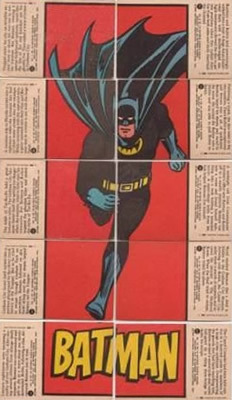 Continuing on from my last post looking at Black Bat Batman Cards, this post will review the 1966 Red Bat Batman Cards also known as the Puzzle A Series. The Red Bat set consists of 44 cards of color drawings on the front and pieces to a series of puzzles on the back along with a story line. 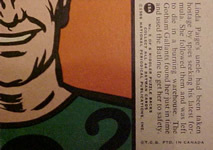 The puzzles make up Batman, Riddler, Catwoman, Joker, Penguin, and Robin when pieced together. 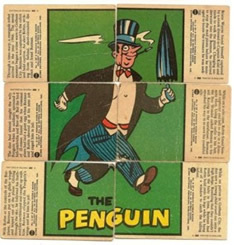 Below is two examples of the Red Bat Puzzles: the Batman Puzzle Back and Penguin Puzzle Back. The backs of the cards are numbered with the appendix A (hence the term Puzzle A Series) as well as a second number showing the location of any given card within each puzzle. 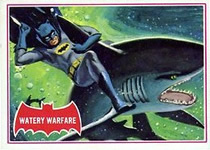 The cards can be distinguished from other illustrated 1966 Batman cards by the featured red bat imagery on the front of the card as well as a red keyline border. Additionally the Red Bat cards do not feature a heading of any sort on the back of the card unlike the Blue Bat puzzle cards. This set was produced by Topps for the USA market. On the back it states "Copyright T.G.C PRTD U.S.A". Below are two front and back examples of the Topps Red Bat cards. This set was produced by O-Pee-Chee for the Canadian market. It has a back which states "Copyright T.G.C PRTD in Canada". Below are two front and back examples of the O-Pee-Chee Red Bat cards. This set was produced by A&BC for the UK market. It has a back which states "Copyright A&BC Printed in England". Below are two front and back examples of the A&BC Red Bat cards. This set was produced by Scanlens for the Australian market. It has a back which states "Copyright T.G.C PRTD in Australia". As yet I don't have scans of these cards available but am hoping to add the set to my collection soon - I'll be sure to add scans as soon as I have them. If you own some of these cards and would like to contribute scans just drop me a line. 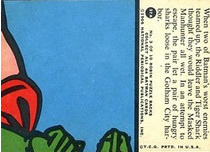 As with the 1966 Black Bat Cards Topps was looking to capitalize on the success of the 1989 Tim Burton film Batman and reissued the Red Bat set. 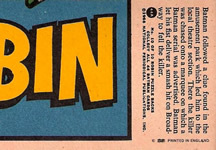 These cards are identical in every way to the 1966 set however they include the extra text: "1966 Deluxe Reissue Edition" on the backs of the trading cards. 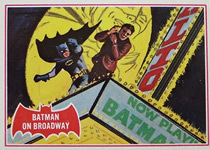 Though the Red Bat cards seem to be somewhat harder to find than the Black Bat cards they are still somewhat readily available at affordable prices online. Given their age mint copies are very hard to find. In addition the puzzle back means that often the cards were played with more than the Black Bat set for example. Centering is poor due to the technology of the day however I think this gives the cards a nice old school feel. This is one set that will stand right out in any great Batman cards collection! 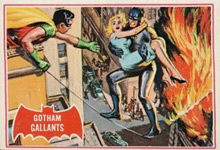 Check out the link below for plenty of connections to Red Bat A Series Batman cards for sale on eBay right now. I'm keen to hear stories and see scans of your cards - email [email protected]. Do you have a great collecting story or rare card scan you'd like to share?